Based in Montreal since 2008, by way of Orlando, Florida, XRAY is a street and fine artist who has exhibited widely in group and solo shows in Quebec and Florida. You may have seen his work in the past few years Fresh Paint Gallery, Station 16, Galerie D, and L’Espace Créatif in Montreal or at the Vintro Hotel & Kitchen’s Pop-up Gallery in Miami. You may also have caught him live painting at Just for Laughs, Fresh Paint, and DÉCOVER Magazine‘s “Expo les Refuses”. 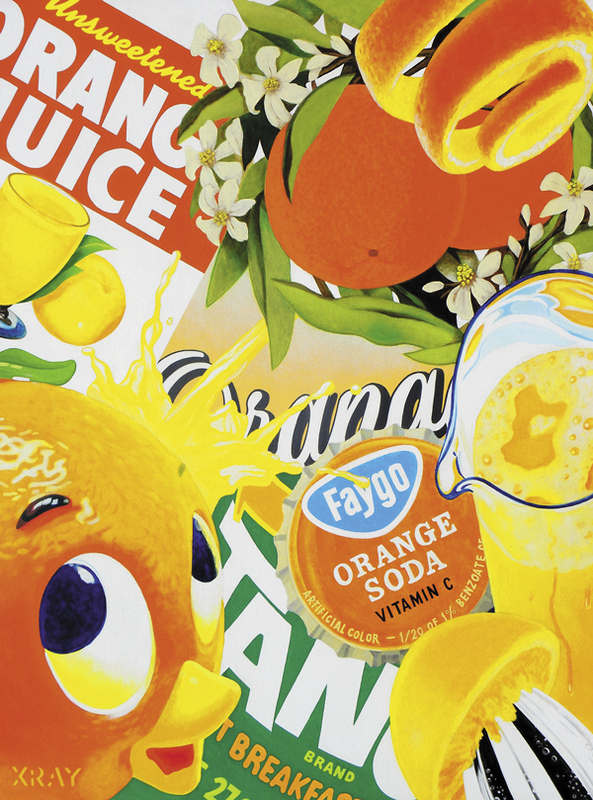 Prints of XRAY’s “Orange Series” are available for purchase HERE. XRAY takes inspiration from military insignia, sign painting, nature, skateboard and tattoo art, old signs, tarot cards, Native cultures, “secret society” symbolism, Japanese art, propaganda, diagrams, video games, the 1980s, science fiction and action movies, vintage advertising, and cartoons to name a few. XRAY paints using hand techniques, but is influenced by what he calls the “computer-graphics age”. The work is generally a combination of brush and spray painting. He strives for a “factory aesthetic” using a hands-on painterly approach, often finishing his gallery work with ultra-glossy resin to achieve the most “plastic”, manufactured look possible. ARTSHOP caught up with XRAY and asked him a few questions. ARTSHOP: Thanks for chatting with us. Can you describe yourself as an artist? XRAY: I would say I walk the line between street and pop art; incorporating techniques, aesthetics and symbolism from all of my experiences in my work. I’ve had five solo exhibitions of my work since moving to Montreal six years ago and I’ve done three installations. I’ve also participated in many group exhibitions, done murals and worked on several collaborative projects in and out of Montreal. Composition, research and personal meaning are important to my work. I am a constant student of the arts and a naturally curious person. ARTSHOP: What art do you like? XRAY: I like art that is moving, personal, exciting or ecstatic. I like art that takes traditional, hand-crafted techniques in fresh directions. I like art that has a distinct point of view. I like art that is spontaneous, child-like and simple. I like art that is methodical, precise and detailed. I never know what will grab me until I see it! It is a very broad question and this is my simple answer. ARTSHOP: What art do you hate? XRAY: Uh-oh, what art do I hate? “Hate” is such a strong word! I better be careful answering this one. I dislike art that is coming from a place of entitlement. I dislike art that says “so and so got rich and famous for doing something like this, so I will do it too!” I dislike art that is pointlessly banal, mundane or decorative. I dislike work that is unjustifiably pretentious or just plain lazy. Again, it’s hard to put a finger on but I know it when I see it. Mostly I try to focus on the things that turn me on. ARTSHOP: What are you working on these days? XRAY: I am preparing designs for a few mural project submissions, finishing up a new series of painted wooden cut-outs and continuing work on “The Orange Series”. I’m also working on a few commissions and some t-shirt and print designs on the side. ARTSHOP: Where did the idea of the “Orange Series” come from? XRAY: The “Orange Series” comes from memories and associations that I developed growing up in Florida. 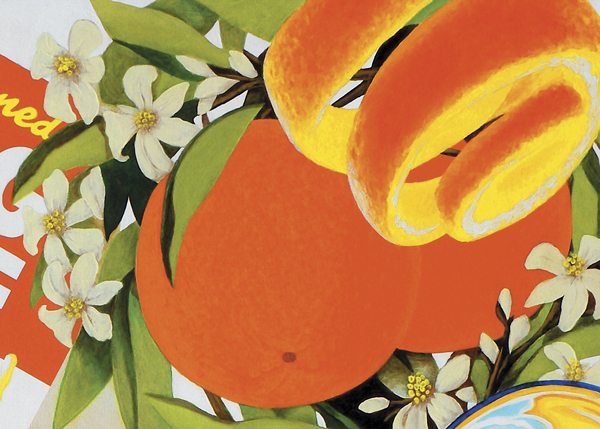 One could also say that it’s nostalgia for an idealized, tropical brand of Americana; an era that never truly existed. 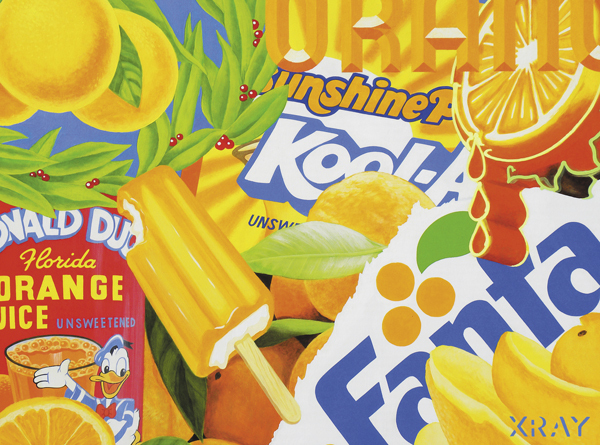 The paintings are filled with references to specific colours, flavors and brands that remind me of happy childhood memories. They give me a feeling of health and joy mixed with a longing for the simple pleasures of naiveté. ARTSHOP: Part of what interests us about these paintings is the strong element of collage. In fact, when we first saw these works, we thought they were collage. XRAY: Jeff Koons has been digitally compositing images and paying expert artisans to paint them for many years. Sometimes I humour the thought that these paintings are my attempt at that level of production…except that I’m doing it all, minus the army of helpers. ARTSHOP: How were these paintings made? XRAY: I arranged and drew the images with pencil onto a wooden canvas that was prepped and painted white. The paint work was done with high quality acrylic art paints. Many different painting techniques were employed including transparent layering, wet blending, and sign painting methods. Though I used masking in certain areas, the majority of the work was painted freehand with brushes. The work was then sealed with a brushed acrylic varnish for durability. Finally, I applied a several light coats of Krylon Gallery Series-Matte Archival (UV protective) spray varnish for a very smooth and non-reflective finish. ARTSHOP: What do you think about the encroachment of a collage vernacular into painting? XRAY: I’ve noticed a movement toward a “collage-like” style of composition in street and pop art. Some notable examples would be Tristan Eaton, POSE MSK and Ben Frost. Here in Montreal, Eric Clement fits this description as well. It’s a good thing; a logical progression considering the hyper-saturated and multi-layered bombardment of information in the world of today. In the case of the “Orange Series”, a fragmented approach to compositional referencing seemed to be the only way that I could get my intended point across. This series is still in progress with more paintings to come and I am enjoying exploring the possibilities of creating in this way. ARTSHOP: How does the series fit into the evolution of your artwork? XRAY: I have been wanting to do this very straightforward and “literal” series of pop paintings for a long time. A few months ago, I took a trip back to Florida that sparked a lot of ideas. I started studies for the series while I was on vacation. I tried to capture exactly what I was seeing in the finished work while letting the arrangement do the talking. These paintings are the most technically challenging pieces that I have done because of the wide variety of advertising art styles they reference. Each one takes about seventy hours of brushwork.